- Steve George is dumped by his wife in front of Danni, and Danni follows suit. - Stonie announces that Debbie has won a trip for two to Perth. - Darren and Libby leave to live together, after facing opposition from their parents. Darren and Libby pull up outside their new abode. They look at it uncertainly, but Darren says it's the only thing in their price range. He promises that it won't be forever. Libby thinks it'll be fine, and is probably really gorgeous inside. Darren isn't so sure, expecting it to be as draughty as hell, but they agree that the main thing is that they're together. Darren's relieved that he won't have to put up with Karl and Susan hassling him any longer, but Libby wonders if they should let them know where they are, and tell them that they're ok. Darren says they can't, as Karl will be down there straight away dragging Libby back. Libby is upset by how devastated Susan was when they left, but Darren knows that the only way to show them that they're serious is by making a clean break. Libby agrees, and Darren tells her it's ok if she wants to back out. Libby is insistent that she wants to be with Darren - whatever it takes. Karl and Susan are blown apart. Susan is extremely upset as she knew something like this would happen. Karl tries to make the situation better by suggesting that Darren's taken her to some rundown shack, but that makes Susan more upset! Karl thinks that it won't take long for Libby to realise what she's given up. SUSAN: And what if she prefers squalor to living with us? What then? What if she gets sick? What if we never hear from her again? Karl tries to reassure her, but Susan is extremely upset and wants Libby back so she can talk to her and hold her. Susan sobs, as Karl insists that it'll be ok in the end. Karl is confident that Libby will come back and this is just a knee jerk reaction, but Susan goes into their bedroom alone. They're both very upset. 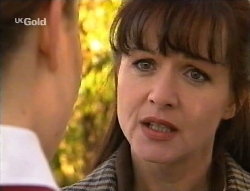 Debbie is reading a note from Billy and Toadie thanking Luke for 'letting them do you-know-what' in his house. Luke explains that they do recordings. Luke comes in and is dressed very sharply for an interview - and Debbie is very impressed! He tells her it's for a job as a kitchen sales rep.
LUKE: Would you buy a kitchen from this man? DEBBIE: Yes, I sure would! I don't even have a house to put it in. Luke tells her to write that down - he might need it as a reference! Debbie says she hopes he doesn't get the job, because she wants him to come to Perth with her on the trip that she's won. Luke thanks her for the offer, but says that he's just getting back into the swing of things - he's got job interviews lined up and he's got an advert out for a new flatmate. Debbie really tries to twist Luke's arm and in the end, he says that it's also difficult because of Danni - he's only just broken up with her and it's a bit soon to be going away with another female. Debbie laughs this off, saying that they're friends. Luke's silence says it all! DEBBIE: What? Do you think I'm going to jump on you the minute I've got you alone? Luke is worried that it will look like he's rubbing Danni's nose in it. DEBBIE: Who cares what she thinks? I bet she's never given your feelings a second thought. LUKE: Well, she has, actually. She really regrets that sorry business with Steve. She's really sorry. DEBBIE: (trying very hard to be lighthearted) Don't tell me you're going to do anything like take her back? LUKE: No, of course not. She fell for the first guy that came along; I'd never trust her not to do it again. DEBBIE: But you still won't rock the boat by coming to Perth with me? Luke tells her he doesn't care what Danni thinks - it's how he'd feel about the situation. Debbie really pushes Luke, saying that he needs to feel good about himself again and there's nothing to stop him. The room is shabby, and the bedclothes are filthy. There's noise from outside and Libby looks unsure about the whole situation. Darren returns to the room, with a dry towel draped over his shoulder. Libby asks how his shower went, but apparently there's a huge queue and the hot water has already gone, so Darren thinks they ought to wait until morning. Darren says that he found some different bedclothes, but the ones that are on the bed are like new in comparison! Libby looks disappointed. Darren tells her that they're not that bad - he's slept in worse! Libby tells him that she can't sleep in them - they're putrid! Darren offers her the cleaner side of the bed, but Libby thinks she might sleep in the chair instead. DARREN: Is it really the sheets that are bothering you, or is it the double bed? LIBBY: It's just not what I expected for our first time. Darren tells her that she doesn't have to do anything that she doesn't want to. Darren says that all he cares about is them having some privacy, where he can spend time with Libby without looking over his shoulder. Libby is relieved. They are happier until they're disturbed by a drunk man returning to his room, waking up his baby and having a loud argument with his wife. Debbie leaves Number 30 and Danni walks across Ramsay Street. Debbie tells Danni that Luke isn't home. DANNI: What were you doing over there then? Debbie quickly thinks and says that she was knocking and there was no answer. Danni thinks that Debbie must be pretty pleased with herself for finding out the truth about Steve and asks if she hired out a detective! Debbie thinks that Danni should be thanking her for exposing Steve as a creep. DANNI: The only reason you contacted Steve's wife was to get back at me for slapping your face. Now, ummm, that's not even low - that's pathetic! DEBBIE: Right. So you don't think that telling a wife that her husband is cheating on her is the right thing to do? Because that's why I did it. For Steve's wife. And for Luke, of course. DANNI: Ah, now that part I can believe! You wanted me to look like a fool, you know, score a few points for yourself! DEBBIE: No, I was sick of seeing you humiliate him! Every chance you got, you paraded your fancy new boyfriend around in front of everybody. When I saw a chance to end it, I grabbed it! DEBBIE: Danni, you are not the victim here, as much as you would like to be. Mrs George and Luke are the ones who've been hurt. All you can think about is how embarrassed you are. That is so selfish. God, Luke is better off without you. Debbie walks off, leaving a stunned Danni. It's morning and Libby is buttering some toast. DARREN: Well, it's a pretty special day. We're making our first breakfast, on our first morning after we've spent our first night together. LIBBY: (smiling) Say that ten times fast. DARREN: We've still got one more first to look forward to. LIBBY: Yeah. It meant a lot, you know, that you didn't. That you were just happy to hold me last night. DARREN: Well, I don't want a medal. If it's not right for you, it's not right for me. Darren says he's going to buy some sheets, which cheers Libby but their good mood is quickly dissipated by a loud argument from the room next door. 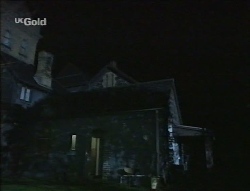 Darren admits that whilst he's out, he's intending to look for somewhere else for them to live. Libby is confused, as she thought this was all they could afford. DARREN: You deserve better than this. And one day, I'm going to get it for you. I promise. LIBBY: And in the meantime, this will do just fine. They're briefly happy, and then the baby in the next room starts crying again! Libby is kissing goodbye to Darren through the window of his ute. Susan is watching. Susan gives Libby a tight smile when Darren drives off. Libby hesitantly comes over and Susan asks where she stayed last night. Libby tells her that she's with Darren, but she'd rather not say where. Susan thinks that Libby has changed - she ran off, and then she didn't even phone to say that she was ok, and she'd never have done that in the past. LIBBY: I'm sorry to be such a disappointment to you. LIBBY: There was no other way. Susan tells Libby that they all love her, and they're her family - and nothing has happened that can't be worked out. Susan asks her to come home, but Libby says she can't - Karl will never accept Darren, so as long as she lives at 28, Karl will make their lives hell. SUSAN: Well, you've certainly made his life hell. He's worried sick about you. Susan begs Libby to give Karl another chance. Libby thinks he's had his chance to be reasonable. Libby says that she feels free being away from home. Susan thinks that feeling free will change when reality sets in. LIBBY: The reality is that Darren and I love each other. And we're going to make this work. I don't expect you to understand that. The schoolbell goes, and Libby says she has to go. Susan calls her back and says that no matter what happens, whether Susan likes it or not, she'll always be there for Libby. Libby listens but doesn't respond. When she walks off, Susan looks very upset. A woman is browsing the designs in Danni's shop (this woman is Sarah Beaumont, but her name isn't mentioned until the end credits). She says that she'd buy out the whole shop and says that the designer - Danielle - has a great talent. Danni is chuffed at this, and the woman says that she worked in fashion for a while in Europe. Danni guesses that the woman worked as a model. The woman says she's given that up now, and would rather work behind the scenes. Danni asks how she's getting on with, and the woman says she's just starting out and not having much luck - but she might give the designer, Danielle, a call. Danni says that she should give it a try. The woman says that given how much talent Danielle has, her ego is probably way out of control and wouldn't want to do business with a small time supplier. Danni smiles to herself. Danni tells the woman that she should give it a go and she won't break into the market with a pessimistic attitude! The woman agrees and asks if Danni knows how she can contact Danielle. Danni comes clean and introduces herself with a business card, explaining that she is Danni - also known as Danielle. The pair giggle. The tea lady brings in some tea for Helen. She apologises for waking Helen, but Helen says that she wouldn't want to sleep through one of her camomile teas! The lady offers to get a nurse to help Helen, but Helen says she's fine. The lady places the tea on Helen's bad side, and Helen eyes it unsure. The lady apologises and goes to move it, but Helen says that she's back to normal now and can manage (er, yeah, right!). The lady says that she'll be back for the cup later. Helen has a huge struggle to try and lift the cup with her poor arm. She manages to grasp it, to her own relief, but as her grip is not what it used to be, she spills it everywhere. This distresses Helen, and she starts to cry. The woman is trying on Danni's designs, and they're both raving about how good they are and how good they look on the woman. Danni thinks the woman will get a modelling job in Australia easily. Danni asks why the woman wanted to give up modelling to go into sales as modelling is more glamourous. The woman says it's not all it's cracked up to be, and Danni guesses that the woman had some bad experiences. The woman says that she just got bored of it, and asks Danni about her life instead. Danni says that there's not much to tell - she's just starting out, and doesn't have much of a name for herself. The woman is impressed that she has a shop and says that's a good start. She asks if Danni runs the shop alone, which she does, and then wonders how she can design *and* serve. Danni says she needs to take someone on so that she has time to design, but she can't afford it. The woman suggests that she'll split the rent with Danni, in return for her merchandise being sold in the store. Danni is a bit stunned and says it's a bit sudden. The woman tells her it's worth thinking about. Danni and the woman are having lunch, and the woman is trying to talk her into the shop idea. Danni says that her instincts are telling her to say yes, but she's always followed her instincts and they've always got her into trouble! The woman guesses that now Danni's going to do the opposite. Danni talks about Steve, and how she believed in him but he turned out to be a two timing pig - so as a result, she's promised herself that she'll think long and hard before jumping into situations. The woman says she doesn't want to rush Danni but if she takes too long, she might pull out. Danni suggests a trial period of 3 months. They shake hands. Luke walks in and he and Danni say hi awkwardly. He goes to the bar and the woman asks if he's the pig and Danni laughs. She says that he's not - he's gorgeous, but things didn't work out between them. She and Luke both look at each other. Helen is sitting up, watching television and crying. Karl comes in and asks if she's ok - and then realises that she's crying at the television! They both laugh. Karl tells her that he's arranged for an occupational therapist to come down and see her so that they can arrange for a early discharge. Helen says she'll be on her best behaviour, but Karl sternly warns her not to bluff her way through the exam. Helen agrees that would be childish, and Karl says about as childish as asking the tea lady not to mention a certain spilled cup of tea! Helen defiantly asks what are a few drops of tea in the scheme of things, but Karl says that they need to know about them - for Helen's own sake. Helen says that she gets the impression that Karl's report isn't going to please her. Karl admits that he's behind in his paperwork anyway as his homelife is commanding his attention. Karl tells Helen that Libby has run away with Darren Stark. Karl says that he doesn't know how to handle it. Helen tells him to imagine that Libby is someone else's daughter, and the advice he'd give to them, he should apply himself. KARL: That's a very good idea. You obviously learn a lot watching daytime television. Luke and Debbie are sitting at a table in the background. Danni is staring at them. The woman is asking if Danni knows anywhere up for rent, or shared accommodation, but Danni is totally distracted. WOMAN: Is she the reason you and Luke broke up? DANNI: (disdainfully) Debbie? It'd take a better person than that to push me off the scene. Although she's trying to muscle in; catch him on the rebound. The scene moves to Debbie and Luke, where Debbie is pressuring Luke to come on the Perth trip. The flights were really booked out, so she's had to book them for tonight. Luke thinks it's not enough time. Debbie tells him that he just has to put some stuff in a suitcase and get someone else to get the mail! LUKE: I've already said no once. DEBBIE: Well, now is the time to say yes, boy! He gazes over towards Danni and Debbie's face drops. DEBBIE: She is the reason, isn't she? *You* are such a lost cause, Luke. You are always letting her run your life for you. LUKE: All right, I'll go. But not because of your little lecture. I'll go because I do need to get away for a while. Debbie is overjoyed and promises that he won't be sorry and they'll have the time of their lives. She shoots a real 'the cat who has got the cream' look over at Danni, who looks gutted. Libby is packing some stuff. Karl enters. KARL: (overjoyed) Sweetheart, you're back! I can't tell you how good this makes me feel! Libby tells him that she's only back to collect some stuff and she's leaving again. Karl wants to talk, but Libby refuses. Karl says that he knows pressuring her won't do any good, but he doesn't want them to be strangers. Karl begs her not to shut him out, but Libby says that's exactly what he did to Darren and to her. KARL + LIBBY: -best of intentions. Karl wants to know where she's going, but Libby will only tell him 'home'. KARL: And I suppose Darren's providing all of the creature comforts, is he?! (he stops himself and puts his head in his hands) I'm sorry, I'm sorry. Will you at least take some money? LIBBY: No! I don't want anything from you. Our new place is luxury compared to this hell hole. Libby leaves and Karl distressedly shouts after her. He pulls the curtain to one side and watches, upset, as she walks away without looking back. Libby walks up the stairs. Lots of people are milling around and loud music is playing. She opens the door to their room and drops her stuff. She looks around and sighs. Eventually, she bangs on the wall of the room next to her and yells for them to turn the music down. There's no response, so she bangs and yells again. MAN: (yelling back) Stop banging, or I'll come and bang your head! Libby looks distressed with the noise and squalor of the room and miserably sits on the bed with her head in her hands. Luke places his suitcase by the door ready for his trip. Danni knocks at the door and asks to come in. She spies the suitcase and asks if he's going somewhere. Luke tells her that he's going to Perth and Danni guesses he's going as the guest on Debbie's prize. Luke insists that there's nothing between them and that they're going as friends. DANNI: If Debbie has anything to do with it, you'll be coming back a lot more than friends. LUKE: You don't want me, but you don't want anyone else to have me, is that right? DANNI: Look, it's because I still love you, Luke and... I want you back. LUKE: How am I supposed to respond to that?! DANNI: I don't know... By saying that you love me too? DANNI: Look, I was stupid and so were you but we had something really special. And we gave up on it but look, I honestly think that we were meant to be together. Come on, Luke, don't go away. Stay here with me!